A twice monthly newsletter with information about workplace safety and health. 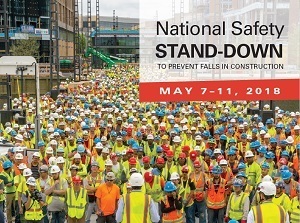 Thousands of worksites will join OSHA and its partners for the annual National Safety Stand-Down to Prevent Falls in Construction May 7-11, 2018, with events across the country. Employers and workers will pause during the workday to talk about fall hazards, OSHA compliance, and industry best practices to prevent falls in all workplaces. The lack of proper fall protection is the most frequently cited OSHA violation. Deputy Secretary of Labor Patrick Pizzella will attend a national kick-off event May 7 in Washington, D.C., at the newly constructed DC United soccer stadium, where experts will demonstrate proper fall arrest systems. For a list of other events, and educational resources in English and Spanish, visit the Stand-Down webpage. Events were held across the country last week in recognition of Workers’ Memorial Day, including a tribute to fallen workers during the Cleveland Indians’ game on April 28. Thirteen-year-old Gerardo “Junior” Juarez – whose father, Jerry, was fatally injured at work – threw out the first pitch. These events not only commemorate those lives lost, but also renew our commitment to protect the safety and health of all workers. 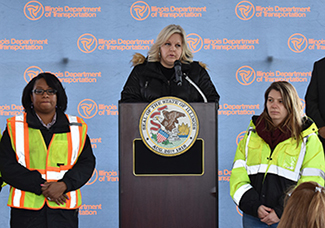 Cheryl Nichols, who lost her husband in a work zone vehicle collision, urges drivers to slow down and remain alert in areas where roadway workers are present. During last month’s National Work Zone Awareness Week, events across the country encouraged safe driving around work zones. The official kick-off was held April 10 in Chicago at the site of a highway interchange. One of the featured speakers was Cheryl Nichols, whose husband Ryan died in 2011 after being struck by a vehicle in a work zone. Following the speakers’ remarks, a group of roadway construction workers shared their experiences facing work zone hazards. Read Illinois Governor Bruce Rauner’s proclamation recognizing the awareness week here. OSHA invites public participation in an upcoming stakeholder meeting on whistleblower practices and experiences related to the railroad and trucking industries. The first meeting will be held in Washington, D.C., on June 12, 2018, from 1:00 to 3:00 p.m. OSHA is seeking input from these transportation stakeholders, which together accounted for the largest number of whistleblower complaints filed in 2017. More information to come next issue. Douglas Stephen Plastics Inc., was cited for exposing workers to safety and health hazards following an inspection of the company’s New Jersey facility. OSHA responded to a complaint of unsafe conditions, and determined that the company exposed workers to amputations, electric shock, and burns; allowed workers to use equipment without proper guards; failed to control hazardous energy; and failed to train powered industrial truck operators. OSHA proposed penalties of $435,679. For more information, read the news release. OSHA has again cited Ohio roofing contractor Benny’s Roofing LLC, for exposing employees to falls and other safety hazards. This time, the company faces penalties of $138,394. In December 2017, OSHA cited the contractor after inspectors observed four roofers at a Cincinnati residential site working without appropriate fall protection. OSHA cited Benny’s in February and April 2017, for allowing workers to use harnesses that did not meet OSHA’s fall protection requirements. For more information, read the news release. OSHA investigated Rural King Supply Inc., after receiving complaints that the company allowed workers to operate a damaged forklift at its Xenia, Ohio, facility, despite workers’ reports of faulty brakes. The farm supply company was cited for failing to take a forklift out of service and perform needed repairs. OSHA proposed penalties of $258,672. For more information, read the news release. OSHA cited excavation contractor Kamphuis Pipeline Co., for exposing employees to trench cave-ins and struck-by hazards on a North Dakota municipal water site project. OSHA proposed penalties of $454,750. The company has contested the citations, and the case will be reviewed by the Occupational Safety and Health Review Commission. Read the news release for more information. California OSHA (Cal/OSHA) issued four citations and $71,435 in penalties to Consolidated Disposal Services LLC, after a security guard at the company’s dumpster yard in Gardena was fatally struck by a truck while working in the early morning hours. Cal/OSHA inspectors determined that the employer failed to provide adequate lighting and traffic controls to prevent struck-by hazards from haulage vehicles. Hawaii Occupational Safety and Health (HIOSH) issued five citations and $102,313 in penalties to Rui Construction Inc., in Honolulu for exposing workers to fall hazards. HIOSH inspectors concluded that the company failed to provide adequate fall protection and personal protection equipment, and train workers on fall hazards. The company was previously cited for these violations in 2014, 2015, and 2017. OSHA has ordered Mr. Good Vape LLC, of Chino, Calif., to reinstate a former manager and pay him $110,000 in compensation after he was fired for claiming that the e-cigarette company’s production of flavored liquids violated federal environmental law. OSHA also ordered the employer to clear the manager’s personnel file of any reference to the matter and post a notice informing all employees of their whistleblower protections. For more information, read the news release. Free webinars from the Safe + Sound Campaign are available this month to help improve worker participation in developing workplace safety and health programs. 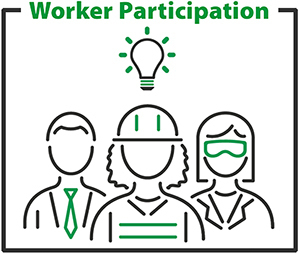 The National Safety Council’s May 16 webinar on Employee Perception Surveys will show how worker input can help employers achieve workplace safety excellence. The American Industrial Hygiene Association’s on-demand webinar, Selling Safety to the Front Line Employee, will help employers identify better ways to communicate the importance of safety to their workers. The webinar is free during the month of May. Bill's Quick Mart, a convenience store in Rogersville, Mo., reached out to OSHA’s On-Site Consultation Program to reduce workplace injuries. A consultant worked with the company to address workplace safety issues concerning personal protective equipment, electrical systems, hazardous chemicals, and labels. The store implemented safety training and abatement procedures, and increased employee involvement in finding and fixing hazards. As a result, it experienced no recordable injuries or illnesses over three years, and was accepted into OSHA’s Safety and Health Achievement Recognition Program, which recognizes small business employers who have used On-Site Consultation Program services and operate an exemplary safety and health program. For more information, read the success story. The OSHA Alliance Program fosters collaborative relationships with groups committed to worker safety and health. Alliance partners help OSHA reach targeted audiences, such as employers and workers in high-hazard industries, and give them better access to workplace safety and health tools and information. The Association of Energy Service Companies renewed a three-year agreement to provide training resources to help protect the health and safety of workers in well servicing and other industries. The Keene State College OSHA Training Institute Education Center renewed a five-year agreement to prevent hazards in general industry, construction, and the maritime trades. The Georgia Adult Blood Lead Reduction Alliance signed a two-year agreement to protect workers from lead hazards, with an emphasis on communicating with hard-to-reach workers. For more information, read the news release. The Missouri Hospital Association signed a two-year agreement to focus on musculoskeletal disorders related to safe patient handling; bloodborne pathogens and infection control; tuberculosis; slips, trips, and falls; and workplace violence. Motor vehicle crashes are the single largest cause of work-related fatalities. The National Safety Council’s Road to Zero Coalition has released a report outlining a plan to eliminate vehicle-related roadway fatalities over the next three decades. 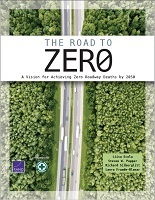 The Road to Zero: A Vision for Achieving Zero Roadway Deaths by 2050, describes how the automotive industry, government agencies, and safety and health advocates can join forces to prevent vehicle collisions. 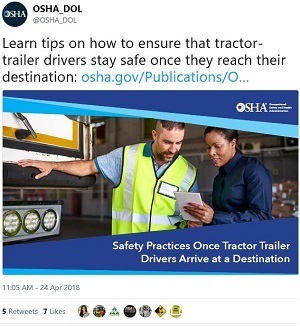 Follow @OSHA_DOL on Twitter (and thanks for retweeting!) 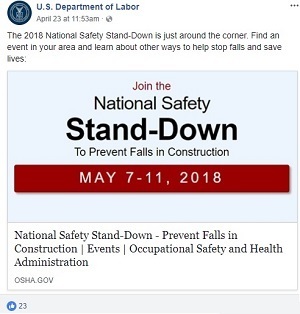 and visit the DOL Facebook page for OSHA information and resources. OSHA also provides news and commentary on workplace safety and health from its senior leadership, staff, and guest contributors on the DOL blog. For more frequent updates on OSHA activities, follow us on Twitter and like DOL on Facebook. QuickTakes is emailed free twice monthly to more than 215,000 subscribers. You can receive it faster and easier by subscribing to the RSS feed that delivers almost instant information. Visit OSHA's RSS Feeds webpage to subscribe. If this email was forwarded to you and you'd like to subscribe, please visit: http://www.osha.gov/as/opa/quicktakes/subscribe.html. Register for your FREE QuickTakes newsletter today!